Our dear friend Alena invited us over for a National Poetry Month party last week and she served us some dang good spaghetti. She hooked us up with her super simple recipe. 1. Lot Lot Lot O' Onion- sprinkle with generous salt and sugar, cook until yellow. 2. Lot Lot Lot O' Garlic, course chop and add to onion, do not let them brown. 3. Add ground turkey- season with salt and pepper, cook till brown (you can drain some fat but I like to keep some in). 4. Add whatever sauce you want, canned tomatoes/fresh skinned cooked tomatoes/or pre-made pasta sauce. 5. Season heavily with basil, dried and fresh, salt, pepper, and red pepper flakes. 6. Simmer until onions break down. 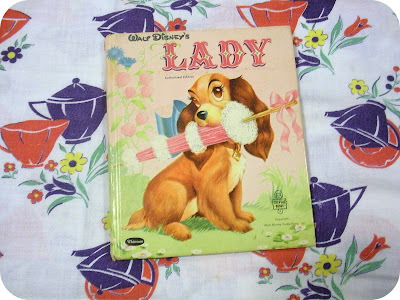 Speaking of spaghetti, we found some classic Disney books while treasure hunting a few weeks ago. Lady will be in the shop soon. I can't wait to eat dinner tonight. The spaghetti sauce is on the stove and it smells GOOD. 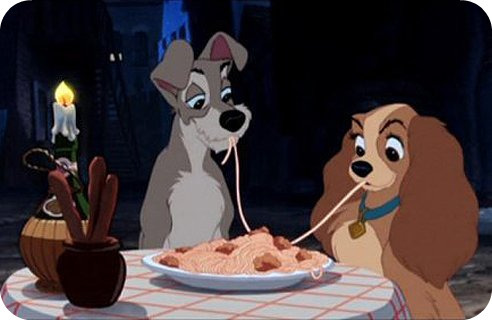 lady and the tramp is one of my all time favorite disney movies! cannot wait to try the sauce. my stomach is already growling. I will be trying this recipe this week. I made a pasta sauce the other day that was YUCKY. This one seems completely different---and so much more simple. I LOVE the old Disney stuff. I can remember reading and looking at the pictures of my Cinderella book over and over again. It was my favorite. It's probably still around there somewhere---but I be it's falling apart. I loved it. LOVE my birthday gifts--and the beautiful wrapping. I'm so happy that you're my SIL!